Dragon Quest V: Hand of the Heavenly Bride was originally made in 1992 for the Japanese Super Famicom system. It was re-released in 2004 for the Play Station 2 in Japan as well. The Nintendo DS version reviewed is the first time this game has left the shores of Japan and was released in North America in 2009. Dragon Quest V starts off with the birth of the main character (whom you name) who loses his mother shortly afterwards. The story resumes with the father and son sailing a few years later. As your father takes care of some business, you are free to explore and fight many classic enemies including slimes, drakeys, jail cats and more; those who are familiar with the Dragon Quest series will feel right at home here. Although there are references to the previous story, you won’t miss out on too much if you haven’t played Dragon Quest IV. After your first bit of exploration, your father will come to your side and will understandably scold you for putting yourself in danger. As the story progresses, you\'ll later meet a girl named Bianca who will encourage you to sneak out at night to a haunted mansion to rescue a saber cat. This cat will join your party and will be the first of many monsters to join your party in your search for the legendary Zenithian helm, armor, shield, and sword. Strong Points: Excellent story and character development. Weak Points: Not much multiplayer interaction other than sharing knick knacks; the monsters are not visible so you never know when you’ll be attacked. Once your party gets a wagon, you’ll be able to accept monsters into your party after you defeat them in battle. The chance of having a monster asking to join your party is random. When a monster first joins your party they start at level one and will not always listen to your orders. Once a monster reaches level twenty, they will obey every order you give them. Each species offers unique spells or abilities so it’s beneficial to collect as many as you can. Monsters are not the only creatures attracted to you. As you can guess by the title, there will be an (unavoidable) wedding taking place. You have the choice between three ladies that will grant you different dialogues but the main story arch will not change. In order to win their favor you have to collect fire and water rings from two different dungeons. After you\'re married your wife can join your party; Just make sure you equip her with more than the wedding veil she comes with. The character development is phenomenal, the best of all the Dragon Quest games I have played so far. Choosing your bride is not easy and I was concerned about hurting their feelings. In an effort to remain spoiler free, I will say that the father-son relationship is especially heart wrenching. Overall the story has a happy ending but there are some heart breaks along the way. The main character lives a tough life and literally goes from rags to riches. Given the emotional attachment to the characters, there are some violent scenes that hit a little harder than your typical fights. Other than violence, there are some goddess and spiritual references. Gambling is prevalent and there’s a fun mini-game called TNT which reminded me of Monopoly. Another cute mini game is a whack a mole style game where you whack slimes instead. Dragon Quest V plays out like many other classic RPGs. The random battles are pretty straight forward, and you can control the actions of your main characters. You can tell your party to flee, defend, attack or use magic. If the enemy you told a person to attack is gone, they will automatically select another monster to attack. When a battle is won, experience, gold, and sometimes a treasure chest is left behind. When enough experience points are accumulated, a character levels up. The attributes and spells are automatically adjusted so there is no customization there. The only way you can impact your stats directly is by consuming seeds of magic, life, agility, resilience, and strength. The items you equip will also impact your stats, but some items are inherently cursed and cannot be removed without the aid of the in-game church. While these cursed weapons may increase one attribute, they\'ll have a negative side effect that will make it undesirable. Most weapons increase your attack attribute, however, there are a few that can be used in battle as a tool. The graphics are similar to those in Dragon Quest IV for Nintendo DS. The towns are colorful and you can rotate the view to get a 3D perspective. The rotating is especially handy in dungeons and caves. The battle scenes have unique backdrops and the enemies and their attacks are animated. Although there’s a lot of variety when it comes to enemies and NPC’s there’s still a fair share of recycling. All the priests and guards look the same and some enemies vary by color and stats. The world is pretty big and you can travel it via wagon, ship, flying carpet or zenithian dragon. Many of the same tunes from previous games carry over into this game but there are some original compositions as well. The music is pleasant to listen to and sound better using headphones instead of the DS speakers. The enemy attacks and spell sound effects are fitting but nothing spectacular. All of the conversations are text based and there is no voice acting. I should note that the font used on the final boss is stylized and incredibly hard to read. The last boss is pretty challenging but as long as your party is leveled up and armed with magic to insulate and buff your party, you should be good to go. Once you have beaten the game, an interactive ending is revealed where you can re-visit various towns and friends. When it comes to replayability the only multiplayer add-on is the ability to collect and share knick-knacks with other Dragon Quest V owners. The single player campaign is pretty thorough and there’s lots of unique items to collect and enemies to fight. I have clocked in over thirty hours and enjoyed this game immensely. 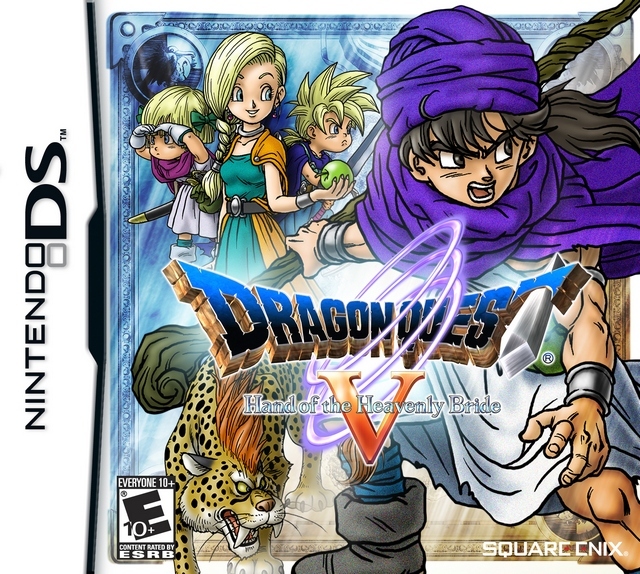 If you’re a Dragon Quest fan and don\'t mind the typical RPG appropriateness issues, add this game to your collection.